"Use these daily warm-ups to build number sense. Go Figure! is a 99-minute PD video that takes you and your staff into three elementary classrooms to see how routines such as "Count Around the Circle" and "Ways to Make a Number" help students internalize and deepen their facility with numbers." continues Stenhouse Publishers. In Go Figure! Jessica Shumway takes viewers into first-, second-, and fourth-grade classrooms where teachers have set up daily opportunities for developing, nourishing, and expanding students' number sense. See number sense routines in action as Jessica, author of Number Sense Routines, and three other teachers engage students in these quick yet numerically rich experiences that, over time, help build a strong foundation for understanding mathematics. Watch how Jessica, Catherine Ermer, Jalyn Kelley, and Camilla Webb make in-themoment decisions about where to take a mathematical conversation and reflect on their instructional planning and students' learning. View children engaging in playful discussions about numbers. Hear Jessica answer teachers' frequently asked questions about implementing number sense routines. And learn how to implement and enrich your own mathematics teaching through these powerful routines. 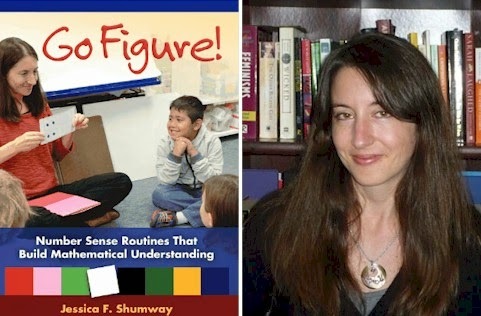 Jessica Shumway has worked as a second-, third-, and fourth-grade classroom teacher and as a mathematics coach for teachers of grades pre-K-5 in Texas and Virginia. She is currently a doctoral student at Utah State University, and she also instructs preservice teachers and studies mathematics education. Jessica received her bachelor's and master's degrees from George Washington University. During her college years, she volunteered at an elementary school and a high school in Washington, D.C. She tutored students in math and English and found that she really looked forward to her time in the schools and with the students. "The more I was in the schools and the more I inquired about teaching, I realized that I wanted to be a part of such an important profession." Jessica says that she became a teacher because teaching is a meaningful and challenging profession. "It is true hands-on, active work in which there is never a dull moment. As a teacher, you really get to know and understand a group of young people. You get to watch them grow and reach their goals."